In the early morning hours we will go by jeep to Spituk, where horses will be waiting to carry our equipment. The trek will begin along an old jeep road into a parched and exposed region, so water and sunscreen are absolutely vital! 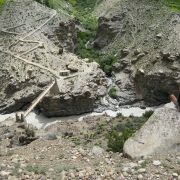 After plodding through the shattered land we will enter the lush Zingchen Valley, where the Rumbak River flows into the mighty Indus. Further into the valley lies our campsite, in the two-house hamlet of Zingchen (meaning ‘big field’). Today we will enter Hemis National Park where we may be fortunate to glimpse wildlife. The National park homes snow leopard, lynx, Ladakhi Urial (a type of goat), arghali (great Tibetan sheep), Bharal (blue sheep), red fox, Tibetan wolf, dhole (wild dog), marmot and mountain hare. After paying the entrance fee, we will climb gradually through a beautiful gorge before reaching the valley leading to the village of Rumbak. Here we will stop at a tented teahouse run by women from the village. 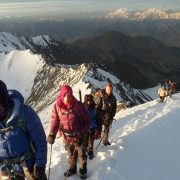 After a cup of warm tea we will continue past the house of Yuruche before reaching camp at the base of Ganda La (4545m). From our campsite there are spectacular views of Stok Kangri and the whole Stok range. After a light breakfast, we will begin our 2-hour ascent towards Ganda La (4900m). The usual chorten and prayer flags mark the top of the pass, where one may see blue sheep, marmots and arghali roaming the hills around. Views of the lofty Zanskar Range and the distant Himalaya Range are great as well. After a short rest, we will make a gradual descent to Shingo and break for lunch. 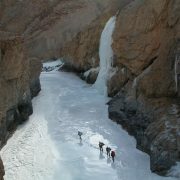 We will finish the day by hiking for 2-hours through a spectacular gorge before making camp at Skiu (3300m). Within this idyllic village lies an old monastery and ruins of an old castle, once a rest stop for the Royal family on their way to Srinagar. Following the Markha River, we will hike through the lovely valley on a fairly level path. The trail crosses the river at various points, and passes winter settlements that contain Lhatos (religious shrines for local deities) and Mani walls (stones inscribed with Buddhist prayers). During peak season a number of tented teahouses will be open for refreshment. Markha (3800m) is the largest village in the valley, consisting of around 20 houses, an old monastery and a ruined fort. The Markha valley trail continues pass old stone-mills, a ruined castle and the auspicious monastery of Techa, which proudly perches upon a cliff that looms above Markha. The path then intersects the river several times before cutting through the last hamlets in the valley. After leaving the village of Umlung, we will be afforded our first view of mighty Mt. Kang Yatse (6400m), which will stay in sight until we cross Kongmaru La. After we break for lunch in the village of Hangkar (the last one in the valley), we will continue onward to the lovely green pasture of Thachungste (4100m), where we will make camp. Today the trail will lead us up to the beautiful plateau of Nimaling, where the people of the Markha Valley bring their herds to graze during the summer months. At 4700m, Nimaling is the highest camp (4600m) on the trek, giving us spectacular views of the huge peak of Kang Yatse to the right. 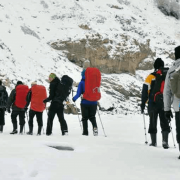 After a hearty breakfast, we will cross Kongmaru La (5200m), the highest pass on the trek, and from here we will have a wonderful view of the Indus Valley and Ladakh Range. 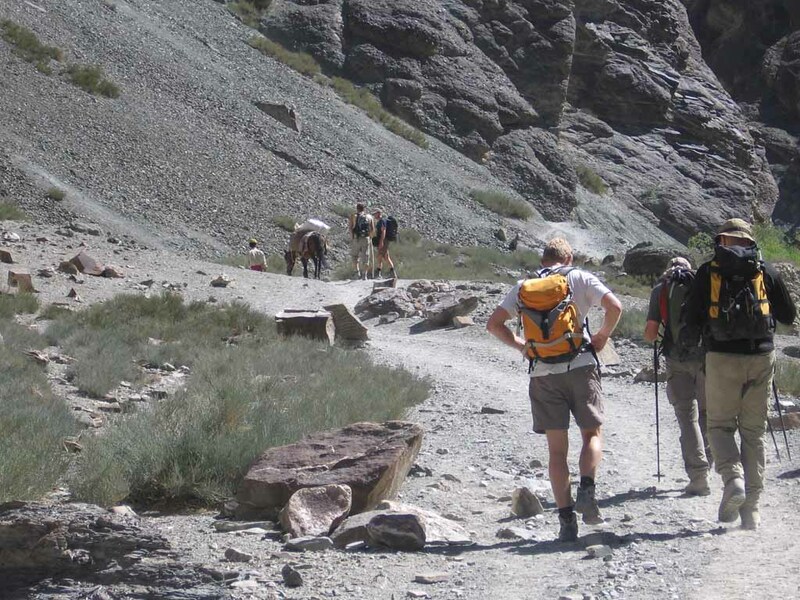 The descent is quite steep, but will gradually level out as we enter Shang Gorge, with its fascinating rock formations. More river crossings bar our way before we arrive at the sour-spring of Chuskurmo (used in traditional medicine by the Amchi doctors). Camp overnight in Shang Sumdo. We will enjoy a pleasant 2-hour walk along a jeep road to Martselang, where the jeep will pick us up. 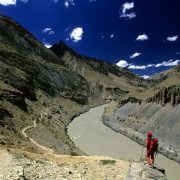 On the way to Leh, it will be possible to visit some of the great monasteries of Ladakh such as Thikse, Hemis and Shey.